As well as joining Formula E for the fifth season, Nissan has unveiled a brace of EV concepts at the Tokyo Motor Show 2017. 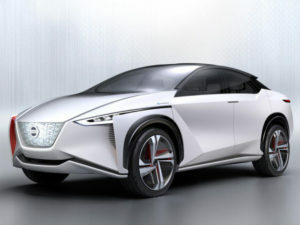 Nissan’s halo show car at the Japanese show was the Nissan IMx zero-emission Crossover concept. The four-seat crossover concept purports to offer fully autonomous operation and a driving range of 372 miles (600km), according to the Japanese JC08 standard). The large-capacity battery can also be used for vehicle-to-grid (V2G) power and charged wirelessly or via a cable. In addition to a long range, the IMx is equipped with a twin-motor setup delivering 320kW and 700Nm torque. The company also unveiled the Nissan Leaf Nismo concept, which aims to improve on the notion that EVs aren’t fun. The sporty NISMO bodywork improves on the regular Leaf’s, offering less lift. Nissan did not allude to any actual performance upgrades other than appearance, however, nor whether the car would make it to production. Finally, Nissan surprised with the introduction of “Canto”, which the company says is the future sound of Nissan’s electrified vehicles and provides an audible tone to alert other road users and pedestrians to the vehicle’s presence, without being disturbing to pedestrians, residents or passengers.